The 2008 election showed how much the Republican Party has fumbled — and fallen — since the glory days of Ronald Reagan. But the GOP's power can be restored if it renews its focus on the party's core values. 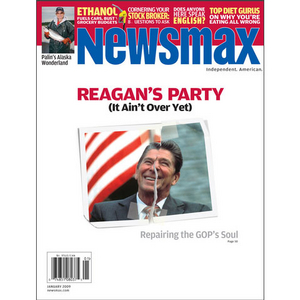 Newsmax magazine's special report "Reagan's Party (It Ain't Over Yet): How The GOP Can Rebuild" examines where Republicans have gone wrong in recent years, where they stand today, and how they can use the Gipper's agenda to brighten their political future. At stake: the very soul of the Republican Party. Michael Reagan's surprising take on "who killed the Reagan era"
Sarah Palin could become "the white Oprah"
The filibuster question: Who in the GOP will cross the line? Five diet gurus tout "expert eating"